I was craving something sweet over the weekend but I didn’t want chocolate, shocker right? 🙂 I wanted something fruity, but with an earthy vibe. When I was at the market this weekend I spotted the perfect thing to satisfy my sweet craving, the delicious golden gems we refer to as dried apricots. Mmmm… there is nothing better than apricots and honey, they go together like peas and carrots, so I came up with these delicious apricot honey bars! 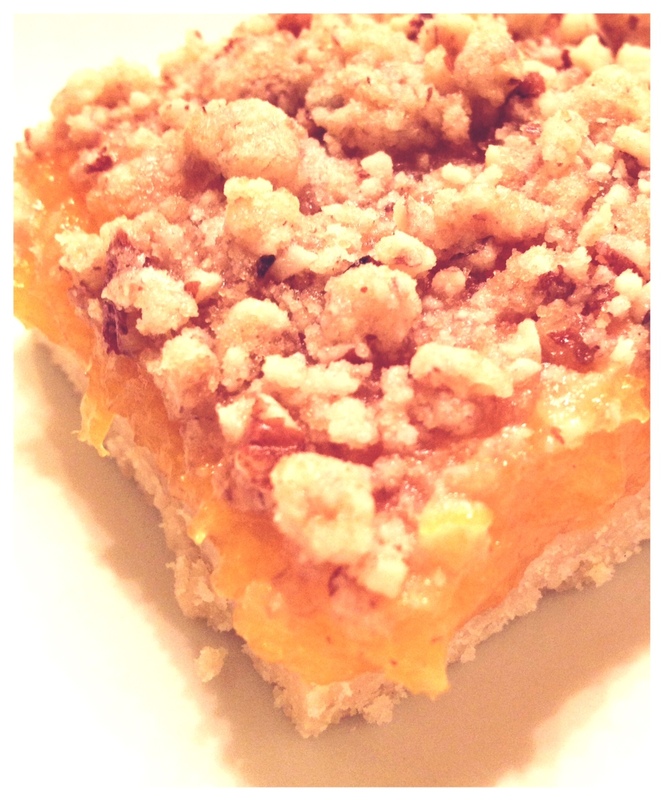 The yummy apricot honey filling is perfectly complimented by the subtle taste the shortbread base lends and the brown sugar pecan crumble topping is just right. Enjoy! Mix 2 1/4 Cup flour, 1 1/2 sticks softened butter, powdered sugar and vanilla with electric mixture thoroughly then press into an even layer in baking dish. Fill a large pot with 2 cups water, apricots, 1/4 Cup granulated sugar, and honey. Let boil for 20 minutes. Take the apricot mixture and either blend it in a food processor, blender, or with a hand blender till fairly smooth. Pour apricot mixture on top of shortbread. Blend cold butter, brown sugar, pecans, and 1/2 cup of flour in food processor until mixture has pea sized crumbles. Cover bars with mixture then bake for 25 minutes.